Trauma patients rushed to A and E at Nottingham University's Queen’s Medical Centre with serious eye injuries can now benefit from a ground-breaking sight-saving wound dressing made from amniotic membrane. The unique biological dressing ‘Omnigen’ has the potential to revolutionise the treatment for emergency cases of ophthalmic wounds including abrasions, burns and more serious perforations, as well as planned operations on the eye. Omnigen was originally developed by researchers in The University of Nottingham’s School of Medicine and has now led to the formation of a University spin-out company NuVision Biotherapies. Over the past two decades, amnion — the innermost layer of membrane from the amniotic sac collected from caesarean deliveries of newborn babies — has been developed for a number of medical applications including wound care. The tissue is rich in collagen and a variety of growth factors that can promote wound healing. It also has natural antibacterial properties, immediately reduces pain on contact with a wound and can be used on patients of all blood types. Currently, amnion for medical use is stored by cryogenically freezing it at -80˚. 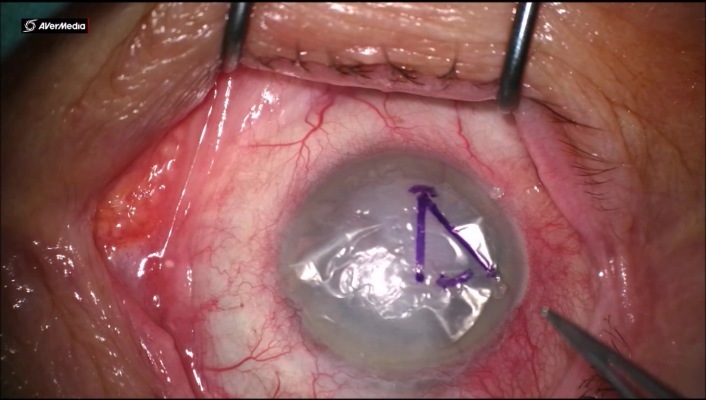 Unfortunately, this method of preparing the membrane and storing it at such a low temperature can damage the tissue and reduce its clinical effectiveness. However, until now, these difficulties have also prevented amnion from being used as an emergency therapy for the routine treatment of trauma. Freezing the tissue also requires heavily regulated cold chain storage and costly logistics, which prevents storage in hospitals. Amnion can only be distributed for scheduled surgery once ordered, taking up to 24 hours for delivery, on a named patient basis, and once it reaches its destination must be used within 48 hours or be discarded. Using a patented Tereo™ manufacturing process, NuVision Biotherapies has standardised a new approach to processing the membrane and preserving its therapeutic properties in a new easy-to-store dry format. When applied, the natural moisture in the eye works to rehydrate the patch and immediately delivers a 70 per cent reduction in pain for the patient without the need for extra painkillers. The way the amnion is treated also retains some antibacterial features, which results in extra infection-fighting properties and speeds the healing process. It can be applied on a structure converting it into a type of contact lens which can be removed and reapplied as necessary or can remain in the eye as a type of scaffold on to which eye cells can grow as the organ heals. For the first time, hospitals can order specially vacuum-sealed packs containing multiple bandages to be stored with regular hospital supplies at room temperature and used immediately in the event of emergency cases coming into the A and E department. Nurses can be trained to apply Omnigen, offering even more flexibility to the NHS and benefit for patients. Professor Harminder Dua, Professor of Ophthalmology and Visual Sciences and Honorary Consultant Ophthalmology, is already treating patients with Omnigen at his clinic at Nottingham University Hospitals NHS Trust. NuVision has also received funding from the Ministry of Defence, which was interested in the potential of Omnigen for treating injuries on the battlefield. Omnigen is also safe for use across the human-animal barrier. It is currently being used by veterinary surgeons across the UK for treating larger animals such as dogs, cats and horses. Find out more about Omnigen and NuVision Biotherapies.